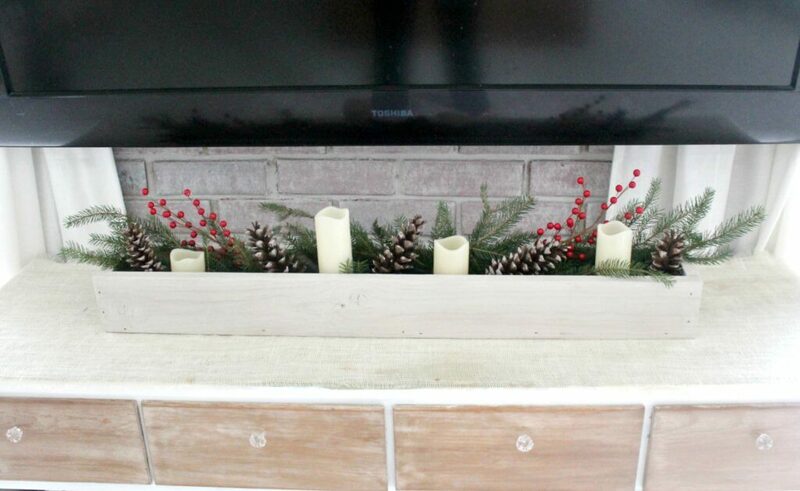 This DIY Christmas Centerpiece is the first in a series of cheap or free Christmas décor! As I decorate our new home for Christmas for the very first time (I’ve only been waiting for this moment since March) I’m finding that the decorations we had for our old house don’t stretch very far in our new home. I’ve decided to try thinking outside the box this year with our décor and repurpose things we already have. I’m all about putting in a little elbow grease if it saves money, and–if we’re being honest–the process of creating something is much more fun than buying it anyway, amiright?! If we’re being honest, I actually created this centerpiece for our entertainment center, to freshen it up for Christmas, but I fully intend on using it as a table centerpiece when we host Christmas this year. There she is displayed in our living room! 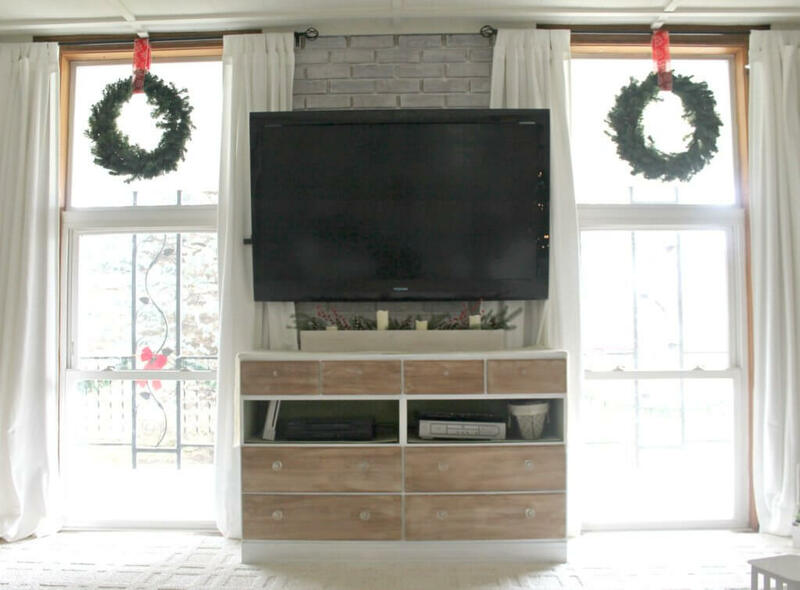 This project is seriously so easy–I think we finished it in under an hour. 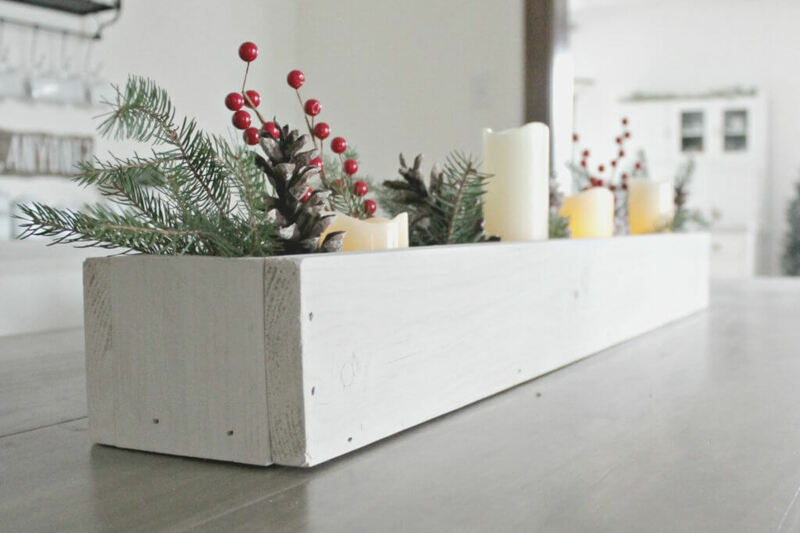 So are you ready to make your own DIY Christmas Centerpiece? Pallet Wood: Pallets can be picked up for free at local lumber yards, or you can dig through your scrap pile, like I did. Candles: If you have a candle stash, go ahead and raid it to save even more money, but I went all out and splurged on a relatively inexpensive LED remote control set. Berries: I bought mine at Hobby Lobby for less than $2. Paint: Or stain. Whatever floats your boat to finish off your wooden box. Pinecones: I stole some from a friend’s house, but you can also buy them here. Once you’ve gathered your supplies, go ahead and make your box. Cut it to any dimension you need. Ours is about 2 1/2 feet long. Then go ahead and assemble and nail together. We did a VERY simple design and attached the boards with a nail gun. Next, go ahead and paint your box. I used Miss Mustard Seed Milk Paint in Grain Sack and I’m in love with how it works on raw wood. I used a watered down wash and it created a really pretty whitewashed effect. Now it’s time to assemble your centerpiece! I found it easiest to start with the fresh greens as a base. I just clipped off tiny branches and placed them in the box. Then I added the candles. Mine were all varying heights, but I still used small wooden blocks as platforms for the shortest ones. Stick in some berries and some pinecones and voila! 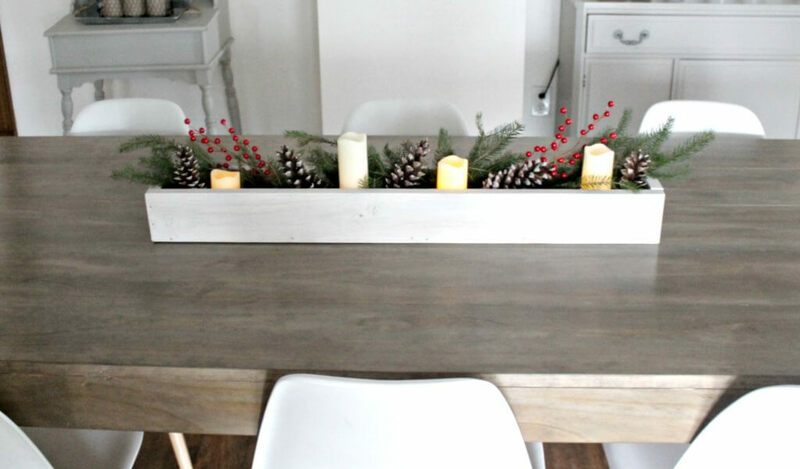 Your very own DIY Christmas Centerpiece! And honestly, if you get creative and use what you already have, this could easily be a free project. Not too shabby, huh? This is my first year using lots of fresh greenery in my Christmas decorating and I gotta say–I’m loving it! How do you guys style your Christmas greens? !